Well Caps fans, you asked to bring the excitement, well here it is with one more victory over the Vegas Knights, 3-1 in D.C tonight, the Caps are just two victories away from their first Stanley Cup victory in franchise history and with Ovie playing at the top of his game, many are predicting the end of the road for the Knights to be in Game 5 next week in Vegas. Just liked talked about in our last piece about what has changed since 1998 for this franchise, well the first thing is Ovechkin is playing his career best in the playoffs and he finally has an entire cast of players that are getting it done. Don’t count out the Cinderella Knights just yet, because while there may be two games remaining, one of those has to occur in Las Vegas next week. 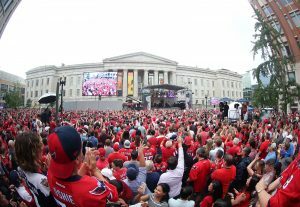 The biggest difference in the game tonight was not the hype before the game on the streets that transformed into hype on the inside of Capital One Arena, it was the Evgney factor. That’s right, many counted him out of the game tonight and so did perhaps Vegas, but he surprisingly turned that game time decision into a big difference in the game. Kuznetsov, playing on the top line with Alex Ovechkin and Tom Wilson, didn’t show any discomfort when he fired a shot past goalie Marc-Andre Fleury at 12:50 of the second period. Earlier in the period, he drew an assist on a goal by Ovechkin. With the goal tonight, Kuznetsov continues to lead all playoff scorers with 27 points. He has 12 goals and 15 assists. Devante Smith Pelly may also be playing some of his best hockey of the playoffs and could become one of the X factors should this go past Game 5 for the Caps. His shot tonight gave Holtby and company everything they needed to build the confidence that they could finish off the series in Game 5 next week in Vegas.